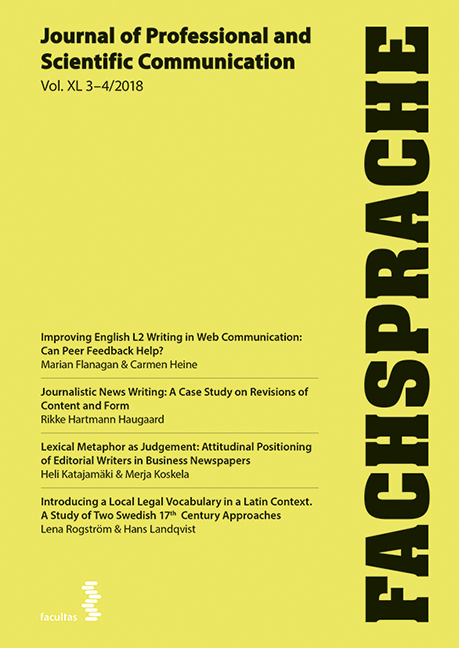 Fachsprache - Journal of Professional and Scientific Communication - is a refereed international journal that publishes original articles on all aspects of specialized communication and forms an interdisciplinary forum for researchers and teachers interested in this field of research. Fachsprache is committed to promoting high-quality research and the improvement of specialized communication and knowledge transfer including the qualifications required for this. It places equal emphasis on rigour and comprehensibility aiming to bridge the gap between researchers who share an interest in specialized communication but come from different disciplines, which may range from linguistics, psychology, lexicography, terminology, and translation studies to the neurosciences and domains such as business administration and economics, law, medicine, science and engineering. Special thematic issues are published regularly. Das Magazin erscheint in Englisch und Deutsch, fallsweise in Französisch und Spanisch.